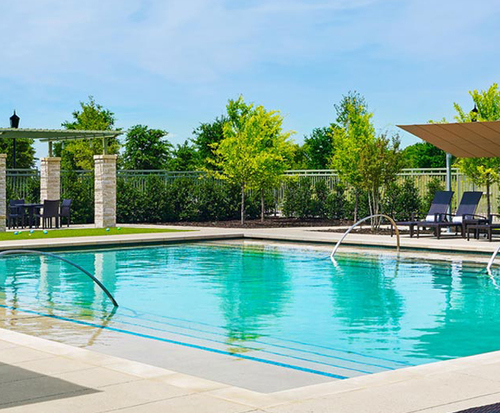 The Sheraton Stonebriar hotel is conveniently located right off of TX Highway - one hundred twenty-one. It is located in both the Collin and Denton counties. If golfing is your sport head on over to Topgolf which features one hundred and two bays within three floors and a rooftop terrace with multiple bars. If you are more into extreme sports check out Canyons of Frisco where there is ten thousand square feet of climbing area and various skill stations depending on the level of skill. The hotel features four unlimited services. High speed internet, a business center, a twenty-four hour fitness center, and twenty-four hour concierge service. If you are in a social mood, the Sheraton hosts a social hour on select days in the week where you can compare Sheraton Select wines that have been rated 90+ by Wine Spectator. Several rooms are available for your choosing. 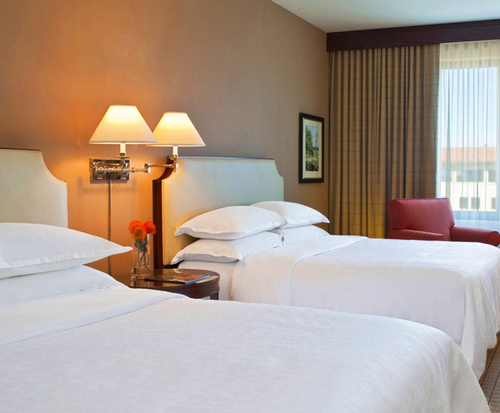 A standard room with two queen beds or a standard room with one king bed, a club room with one king bed, an oversize room with one king bed, a junior suite with one king bed, or an executive suite with one king bed. The standard rooms offer an average room size where as the suites offer more living space. 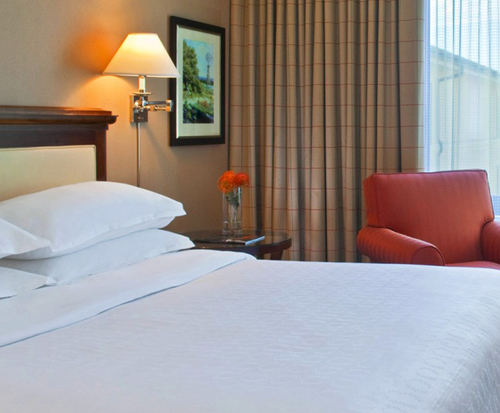 Every room comes with a thirty-two inch TV, coffee/tea maker, and high speed internet. While you are in town you can take a short drive to the Hawaiian Falls Water Park to cool off. Enjoy the wave pool, adventure river, and sixty-five foot water slide. You can also visit the Toyota Stadium which is home to the major league soccer team and hosts many concert venues.